Ships Monday, April 22 if ordered in the next 2 days, 15 hours and 21 minutes! Extreme Accuracy. Easy to Test in 4 Steps - Zero the Checker, Add a regent to your water sample, Insert the Vile in the Checker, Read the Numbered Results. BOOM EASY. ZAIR. Zero, Add, Insert, Read. Includes reagents for 25x tests. The Hanna Marine Alkalinity Checker® bridges the gap between simple chemical test kits and professional instrumentation. Chemical test kits have limited accuracy and resolution since they rely upon the human eye to discern differences in color. Professional instrumentation incorporates a light source such as an LED or tungsten lamp with a filter and a light sensing detector to precisely determine absorbance and ion concentration. Professional instrumentation offers greater resolution and accuracy but can cost hundreds of dollars. 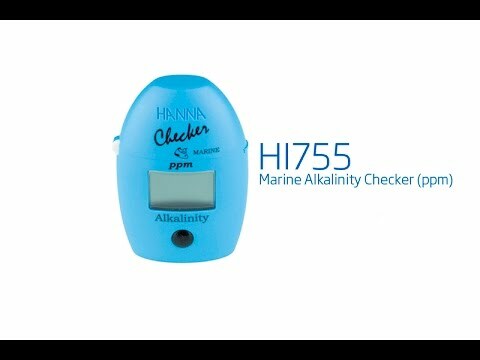 The Hanna Marine Alkalinity Checker® uses a fixed wavelength LED and silicon photo detector to provide the accuracy of professional instrumentation at the affordable price of a chemical test kit. *To zero 1 ml of reagent A is added to deionized/distilled water as a blank. HI755 Checker® is supplied with (2) sample cuvettes with caps, alkalinity reagent starter kit for 25 tests (1 bottle of alkalinity reagent), 1 ml syringe and tip), ­­­ battery, instructions and quick start guide.